Anyone who rides a bike in Midtown Manhattan, or plans to once bike-share comes online this summer, should be interested in tonight’s Community Board 6 meeting. 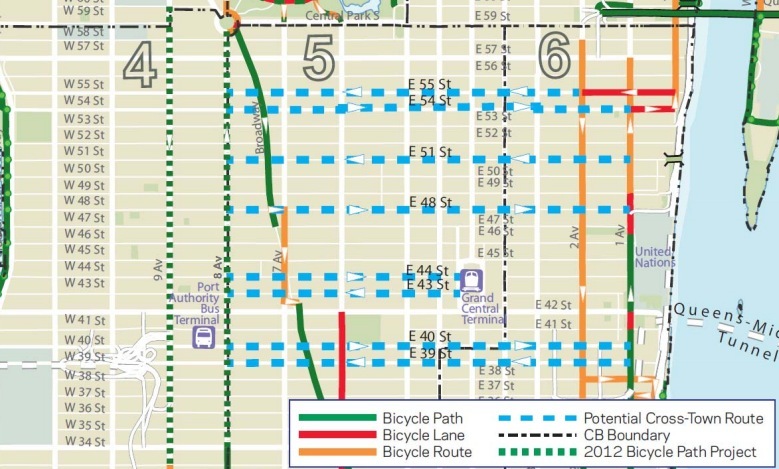 A full board vote is scheduled this evening on four new pairs of crosstown bike lanes planned for 39th to 55th Streets. Though the lanes would consist of no more than thermoplast on pavement, and will be broken up by sharrows, from what we hear local NIMBYs have it in their heads that the project will impede emergency vehicle movement. A significant show of opposition is expected. DOT will also be on hand for a bike-share presentation. Note: According to CB 6, the bike-share presentation won’t be happening tonight. Tonight’s meeting will begin at 7 p.m. at NYU Medical Center, 550 First Ave., Alumni Hall A. One guy warned of the bike-terrorism connection. Told of how bikes were used in a terrorist attack in India. ddartley – absurdism aside, what was the actual result of the meeting? What is the actual reasoning behind the claim that this would impede emergency vehicles? There was a yes vote at the meeting last night. If you put a bike lane in then drivers have no choice but to double-park in it which in turn impedes emergency vehicles. So you see, it’s the bike lane’s fault. oops that was for Mike. If you want safer crosstown bicycling routes before someone else gets hurt, you can speak up tonight for this protected bike lane project. The DOT design is expected to include parking protection, but not during rush hour, when cyclists need it most. Wednesday is the big day, with public meetings about protected crosstown bike lanes in Midtown, the Fourth Avenue redesign in Brooklyn, and the next phase of the Queens Boulevard redesign.